Struga, 마케도니아의 프리플로우 호스텔 | 호스텔월드에서 예약하세요. Book 3 nights, get free laundry. FreeFlow Hostel is a place for you to unwind, relax, and recharge. 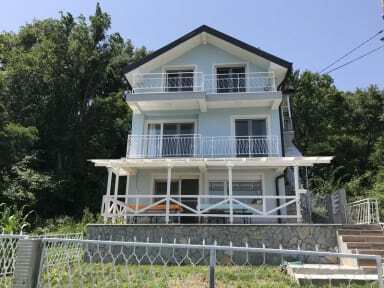 It's a small, intimate hostel located in the village of Radožda, away from the hustle and bustle of city life. Here, you can swim, fish, ride a bicycle or kayak, or just chill out on the terrace and enjoy the views of the lake and surrounding mountains. 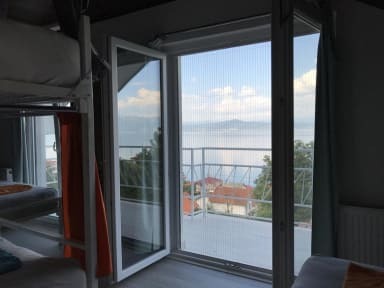 The hostel is minutes away from Lake Ohrid, historic sites, the best and cheapest fish restaurants in the country, markets, bus stop, Kalishta Monastery, an aqua park and spa, the cities of Struga and Ohrid, Jablanica mountain range, and the Albanian border. We are a staff of travelers and enjoy meeting and hosting fellow explorers, and we want you to love this area as much as we do. When you need a holiday, or a holiday from your holiday, take a break at FreeFlow Hostel. Free: Breakfast (included in the price, which includes homemade banana bread, organic cheeses made from our neighbors, and other regular items), coffee and tea all day and night, wifi, parking, linens, towels, lockers, hairdryer, iron, and fishing gear. Extras: Kayaks, bicycles, laundry (free if you book 3 nights), aqua park and spa, and transportation till 22:00 (10pm). If you need a ride from Struga bus station or Ohrid airport, please contact us immediately. Address: Radozda B.B., Struga 6330. Republic of North Macedonia. By car, the city of Struga is 15 mins away, Ohrid Airport is 25 mins away, the city of Ohrid is 35 mins away, and the Albanian border is 25 mins away. Cancellation policy: 48 hr before arrival. No bachelor or bachelorette parties. No groups more than 4 persons.